I met Simon the Sorcerer a few years ago. He was a pixelated lad in a fantasy world, wearing jeans and a magician’s robe much too big for him. He had a charming way of storing inventory items in his hat. He spent more time making snide comments than performing magic and he enjoyed rude jokes. I stereotyped Simon as an obnoxious little wart, and I abandoned him to spend time with fantasy heroes in other games. Heroes who were less pixelated, better dressed, more mature and polite. Fast-forward a few years, and I’ve once again encountered Simon. He’s been through all sorts of experiences in those intervening years and he’s now on his fourth adventure. He’s no longer pixelated. He’s grown tall enough for his magician’s robe and he still puts inventory items in his hat. He’s (marginally) more mature. His humor is more absurd than rude, though I still wouldn’t call him polite. In Simon the Sorcerer 4: Chaos Happens, the joke’s on Simon, as he returns to the Magic Kingdom to find old friends who think he’s someone else – someone earnest, respectful, and law-abiding. Somehow, between Simon 3 and Simon 4, our hero has acquired a double who looks just like him but has polar opposite traits. The double (“Fake Simon”) is scrupulously neat, kind to animals, conventional and reliable. Yes, Fake Simon is just like those heroes I abandoned Simon for years ago. So why does Fake Simon now seem sort of, um, unattractive when compared to the real Simon? Chaos Happens not only has this intriguing “Simon versus Fake Simon premise,” it’s also an unusually good-looking game. Environments are colorful and quaint with exaggerated angles and curves and beautifully tinted shadows. Animations bring the world to life, and include birds and butterflies, fabric fluttering in the breeze, and ripples in the water. Three different areas comprise the game -- a fairy tale town stylishly similar to the creations of Antoni Gaudi, a top-down alternate dimension, and a lightning-struck mythic realm. The graphical style suits this comical fantasy world perfectly. 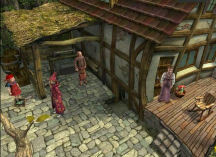 The game uses a third person perspective and you move Simon via the mouse in the standard point-and-click fashion. Character movement is acceptably smooth, though faces could sometimes use a bit more expression. Voiceovers are professional and suit the characters (one exception -- Swampy’s irritatingly squeaky Yoda-imitation). 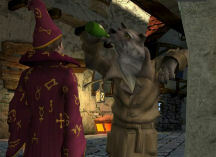 Simon has an American accent, in contrast to his British accent in the original game. The actor who voices Simon ultimately won me over by the inventiveness and savvy in his “reading” of Simon’s character. Sarcasm, a can-do attitude, casual bravery combined with irreverence -- naturally Simon is an American. Gameplay in Chaos Happens is almost entirely inventory based. The inventory system is easy to use. Combinations involve a simple click to pick up the item, which attaches to the cursor, and then a click on the second item. Sometimes items can’t be picked up until you stumble across a “trigger” in the plot or dialog. This is not my favorite type of gameplay. But here the “trigger” is either usually commented on by one of the characters or explained in the game’s hint system, which is better than being left completely clueless. The hint system/journal provides a short explanation of Simon’s current goals, and then supplies graduated hints for the more difficult challenges. Even with the hint system, I was sometimes stumped as to what to try next. On those occasions, talking to the characters again or eyeballing the environments again usually uncovered what I was missing. The game also allows you to identify all hotspots by pressing the “H” key, and exits by pressing the ”E” key, a feature which can eliminate a lot of frustration. Near the end of the game, Simon and Fake Simon face a series of challenges that require them to coordinate their efforts as you switch back and forth between them (one of these challenges is mildly timed). I thought this was an effective way to vary gameplay, but it resulted in what appears to be a dead end during the chess game. I may have simply missed something, but once you control both Simons, I recommend saving often, so that, if you are similarly stymied, then you can go back and resume your efforts. One wonderful feature of Chaos Happens is the map. It displays a miniature of the game world from an overhead view. You can watch Simon run around this small world, or you can double-click to have him go immediately to his destination (this results in a black screen with a stopwatch icon for a second or two). The map relieves a lot of back-and-forthing in the game. The game has unlimited saves, which is quite helpful in a game of this length. I would estimate that I spent about twenty-five hours playing the game. This was partly because I wanted to savor the experience and click on everything to hear Simon’s comments. It’s hard to describe dying in this game without giving too much away. Let me just say that you won’t spend much time repeating challenges because you’ve just died. 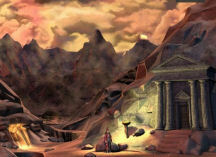 The game contains a few long cut scenes. These drag on a bit, though they do contain some amusing surprises. Background music is pleasant and unremarkable. I started the game wondering if Simon’s humor was going to make me wish to avoid his company. Unexpectedly, I had the opposite experience. An hour or so in, I was grinning as I played, while shaking my head at the game’s tongue-in-cheek audacity. I particularly enjoyed the chief bureaucrat in the Department of Postmortal Affairs and Terriblix the dragon, both of whom could have come straight from Zork Grand Inquisitor. I had a wonderful time revisiting familiar places and contrasting Fake Simon’s comments with those of the original Simon. I suspect that gamers who harbor a secret (or not so secret) geekish nature will very much appreciate this game. Chaos Happens is fairly dialog-heavy. Conversations can be clicked through. Buried deep in the conflict between Simon and Fake Simon is an implicit exploration of what it means to be a hero. 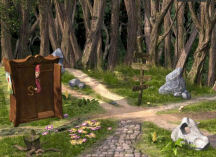 The game contains a conventional side-quest hero from the realm of myths, an overqualified fairy tale hero, plus Simon the antihero and Fake Simon the anti-antihero. Meeting them raises the question: is it character that makes a hero? Or is it what a hero chooses to do – without reference to motivation or possible appalling consequences? So we have a game that does everything it can to smooth and enliven the gaming experience. Entertaining inventory challenges, point-and-click interface, map with hotlinks, a “no pixel hunting” feature, subtitles with scarcely any typos, a hint system, and unlimited saves. It’s a game with dialog that ranges from silly to clever, plus plot twists, riffs on fairy stories and myths, and a hero who has to face himself by dealing with his own “improved” version. I loved Chaos Happens. The only letdowns were the possible dead end, the long cut scenes and the occasional over-the-top comment that provoked my inner Fake Simon. Two difficult challenges: the riddle, which uses words in an extremely confusing way, and the final challenges which require switching between the two Simons. Even with the hint system, it can be hard to figure out what to do next. No sliders, mazes, sound or color matching challenges, one mild timed challenge. No problems with installation or glitches. Be sure to save often when controlling both Simons in case you hit an impasse during the chess game. Simon the Sorcerer 4: Chaos Happens has (as of this writing) been released in the UK, but not in North America. It’s worth tracking down. Gamers who embrace fantasy fairy tale worlds with absurdist antics and a one-of-a-kind hero will spend hours caught up in its spell.